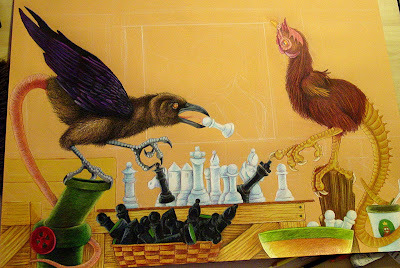 At this point I started working on the foreground and developing the 'story' that was occurring a bit more. There was about a month or two break between where I was at in the last post and what I have here. I changed the theme a bit and decided to have the story occurring in a shed and to put a girl in the window watching. 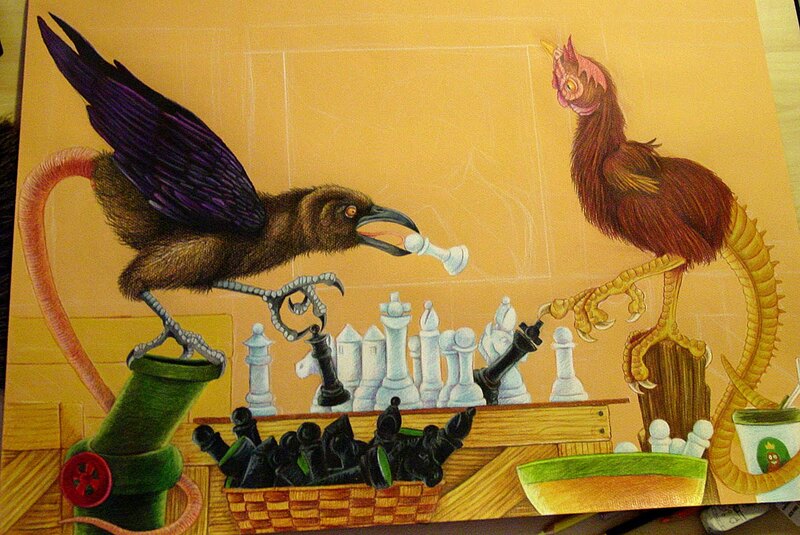 I sketched it all in...To avoid the characters being in the foreground I put two bowls to hold captured chess pieces. I also changed the table to a crate and added two different types of crates to start adding some depth. Because of the difference in color schemes between the two critters I knew I would have to use different crate colors so that items didn't 'blend'. One major problem I noticed at this point was the wax leeching out of the drawing. I have really never had an issue with this because I typically get the item sprayed before this happens...and at least one other colored pencil project took longer than this without and issues. So I was surprised when I lifted off the protective covering and the wax leech was happening. There was a fine film of wax 'ash' that was dulling all of the colors. I can only figure that the high humidity after the AC was turned off had a lot to do with the leeching being accelerated. I carefully took a slightly damp paper towel and wiped off the wax. I had to do this several times over a couple of days before it all stopped. Either it leeched as far as it was going to go or the humidity conditions changed enough for it to stop. Man, I love this! You're really taking things to another level here Brian! I love the way this piece has evolved! Fascinating, if weird creatures - not ones I'd particularly like to meet on a dark night, but really super work Brian! Hey! I'm sure you get this often but... your artwork is really something amazing! Thanks...I get more like, "What's wrong with you exactly"...with the occasional "Are you gonna eat those fries?"